Update (12:39 p.m.): SFMTA got back to us on this. Turns out Kazuko was wrongly cited. The actions described in this account are not consistent with our policy. If the reader is out of service, the patron is not cited if they have a valid Clipper card. The supervisors will remind all TFI’s of this policy. Sadly, Kazuko will have to protest the citation. Not an easy chore. 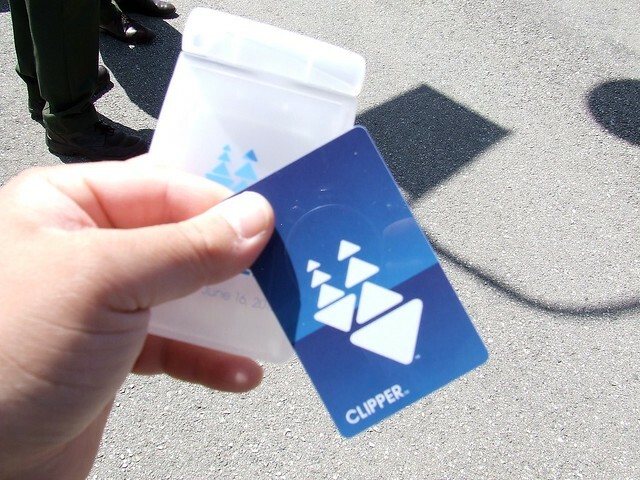 Original post: A few days ago we checked in with SFMTA to see whether the fare policy concerning broken Clipper readers had changed. The SFMTA assured us that the policy has not changed: when a Clipper reader on a Muni vehicle is broken, the vehicle’s operator is instructed to allow passengers with Clipper cards to board. I got on 38L at Geary and Divisadero around 5:10 pm on August 17, 2011. As you can imagine at the height of a rush hour, the bus was completely packed. I entered the bus from the middle entrance. I swiped my Clipper card which had more than $20 left on it, but the machine was not responding. I tired a few times to swipe it to no avail. When the bus stopped at Van Ness, a few officers got on the bus to check everyone’s ticket. As I presented my clipper card, the officer told me to get off the bus, even though he had scanned my card and knewI had more than enough fare left on my card. Confused, I asked him why. He said I needed to get off the bus. I had no choice but to obey. Outside, the officer told me he had to issue me a ticket. If this some kind of joke? We’ll get in touch with SFMTA about readers in the back of vehicles, and the policy for when buses are jam-packed. It doesn’t seem fair to me if fare inspectors are instructed to ticket under any circumstance and let riders fend for themselves protesting their citations. What we need is either a court decision or the BOS to make clear to the fare grinches that if there is adequate fare credit on the card the rider is not evading fare. I also wonder what the policy is when I get on a bus with a broken Clipper reader and then halfway through the ride the readers are up and running again… Obviously one would listen for the beep and then tag the card, but what if the readers reset and you don’t know about it? I wonder about this too. A few months ago I got on the L on the surface and the readers weren’t working, and eventually driver said they were working again, but I could see the ones on my end of the train still weren’t working. Normally on buses, if the front one is broken, so is the rest. On the metro, if the front or rear half of the train is not operational, go to the other side. The “A” and “B” side operates independently from each other. If the Clipper system is broken, you don’t have to pay. The inspectors need better training on this. Any word on what to do when I board an LRV above ground (with broken readers) and then exit at an underground station? It seems fare inspectors would be unlikely to buy a broken reader story in such cases. I had that happen on the J, getting on at Church and Market and exiting at Powell, and the inspector asked me a bunch of questions that no sane person would know the answer to (what was the train number, etc. ), but eventually let me go. I think it was when I said “fine” when she said she’d have to call the train operator that she decided I was probably telling the truth. Do the fare enforcement agents have any legal authority to order you to “get off the bus” and/or detain you? They aren’t police officers with arrest powers after all. Also, what happens when you get a citation and don’t pay it? Do they eventually send you to a collections agency? I thought that they didn’t – but I have sensed a change in their actions over the past couple of months. And not just because of/after the incident with Mr. Harding – well before, in fact. A guy who got off of the N at 9th & Judah didn’t have POP and ran. And was subsequently tackled and arrested around the corner with the assistance of SFPD. The whole fare inspection system seems so damned… adversarial. You’re a paying passenger and you get attitude from the inspectors if you are not sitting up straight, botox smile in place and Clipper card held out – because you’re holding them up. I’ve been on too many buses and trains lately that stop and wait for the inspectors to catch their “slow unpaying gazelle” and pull them off the vehicle before taking off. It messes up connections and scheduling. If it was easier to verify fares with paper tickets, then what was the point with Clipper? Is Muni actually netting more revenue from the system, or less? I just don’t understand why we have the world’s most complex payment system. Is there something wrong with copying the rest of the world? Is there some reason we needed to reinvent the wheel? Cubic – the people behind Clipper – are the people behind the London Underground’s Oyster Card, DC Metro, Chicago CTA & other transit revenue collection systems. Maybe it’s a question of SF Muni implementation. On the few times that I’ve had issues on BART with my Clipper card, the station agent has a reader and is able to look at my card and in one case – issue a travel voucher because the reader didn’t work correctly. I am not sure that Muni station agents have the same leeway, equipment or training. I ride MUNI, BART, and Caltrain. A unified payment card like Clipper was a godsend. Never have to worry about exact change or ticket machines again. Compounding the frustration is when you call SF311 to report a Clipper Card reader outage – they tell you that you’ll need to call Clipper Customer Service about it. If my revenue stream was impacted by broken hardware – I’d want to know and act quickly. So the fare inspectors go nuts again making up policy that doesn’t exist, and innocent commuters like Kazuko who clearly try to pay their fare are caught in the middle. When he protests the ticket, he’ll probably hear that he’s at fault because he boarded a bus through the middle door, an action that is only allowed on Metro cars for whatever reason we’re insisting on this week.